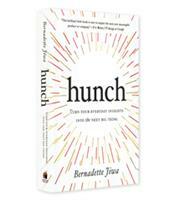 In Hunch, international bestselling author and business adviser Bernadette Jiwa shows how to harness the power of your intuition so you can recognize opportunities others miss and create the breakthrough idea the world is waiting for. Filled with success stories, reflection exercises, and writing prompts, Hunch is the indispensable guide to embracing your unique potential and discovering your own winning ideas. Carol Jones and Victor Pleshev have a six-figure business, with 400,000 customers in 29 countries. They sell ironing-board covers that fit snugly on the ironing board. They had the idea when Victor’s mother had a stroke, causing right-sided weakness. With her ironing-board cover slipping on the board, she found it impossible to iron. Victor decided to try to design a cover that didn’t slip. In fact, Jiwa argues in her small gem of a book, both sentiments are wrong. What in hindsight might seem like a simple and obvious idea that anyone could have potentially developed required insight that comes from observation and the desire to solve problems. Problems are key: Jiwa differentiates between ideas, which are solutions in search of problems, and opportunities, which are problems begging for a solution. Opportunities, she writes, are the safer bet; Fitz Like a Glove is built on an opportunity. “Every day is filled with those opportunities either seized or missed, ours for the taking if only we can learn to listen for them,” writes Jiwa. Hunch is intended to help readers listen for those opportunities. Part two of the book, “From Everyday Insights to Groundbreaking Ideas,” explores the characteristics of successful ideas, such as the importance of practice, which Jiwa illustrates through the inspiring story of a doctor who for years visited the families of babies who had died from Sudden Infant Death Syndrome (SIDS). Over time, Dr. Susan Beal would develop a hunch that sleeping position and the risk of SIDS were correlated. She became an advocate for laying babies on their backs and saved tens of thousands of lives as a result. 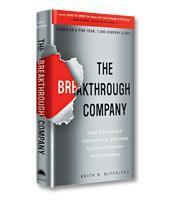 The book’s final section explores curiosity, empathy and imagination in detail, supported by case studies showing how these qualities can lead to the valuable insights from which great ideas and solutions emerge. For example, the ironing-board cover story is from the chapter on curiosity. At the end of each chapter, Jiwa offers exercises to help readers develop these three qualities. The small size of Hunch — it is a small-format book with mini-chapters that rarely extend past two pages — belies the depth of insight, punctuated by innumerable and often surprising stories, that readers will find in this extraordinary book.